Are you a nanny, caregiver, or house cleaner who works in a private home? 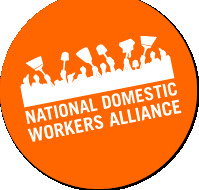 If so, you may be eligible to participate in the National Domestic Workers Survey Project, the first national survey of domestic workers in the United States! This participatory research project is designed to document the demographics, wages, working conditions, and training needs in the domestic work industry. Approximately 2,300 nannies, house cleaners and caregivers will be surveyed in 14 major metropolitan areas representing every region of the country. The survey is being conducted in nine languages. If participants qualify, they will receive a small compensation for completing the survey and will have the chance to make history by participating in the first national survey of domestic workers in the United States!!! The survey is confidential and anonymous! I'm a surveyor for the Boston area. Definitely feel free to email me with any questions or to set a time up to be interviewed!